Several months ago I read The Luxe, the first book in Anna Godberson’s debut series. 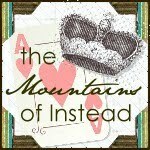 Set in New York of the late 1800’s, it was all ball gowns, old money and forbidden romance. While vaguely entertaining I found the characters dull and it left me feeling distinctly underwhelmed so it was with trepidation that I picked up Godberson’s latest offering. Set again in New York, this time the story takes place in 1929 – the peak of the roaring ‘20’s and a pretty interesting time for young ladies in America, particularly in the country’s biggest metropolis. Bright Young Things follows the paths of three such young ladies who are carving their way in what, for them, is an excitingly brave new world. Astrid, Cordelia and Letty are all interesting girls. They are all aged about 18 but as far as similarities between them go, that is as good as it gets. Cordelia is the closest that Bright Young Things gets to being a lead character, with Godberson allowing her slightly more screen time than her counterparts. She’s also probably the most layered personality. Hailing from the backwoods of nowhere she has a clear sense of how her life should be playing out and staying at home and marrying her childhood sweetheart just doesn’t factor into her vision. I got the distinct feeling that her quest to find her father in New York worked out purely because she never really doubted that it would. However, she’s not always likable with her single-mindedness sometimes seeming selfish and tactless – this is a girl who is always going to do exactly what she sees fit, regardless of casualties along the way. Astrid is completely different. Daughter of a serial divorcee, Astrid has lived a monied life off the backs of various stepfathers. She’s flighty, fairly carefree and really quite lovable, floating through a life of parties, fashion and country clubs. She’s not without other aspects, however, and her relationship with both her mother and with her boyfriend, Charlie, adds an edge to what would otherwise be a fairly shallow character. Astrid was by far my favourite of the three girls and has the most potential for growth. Letty, conversely, I couldn’t stand. What I suspect is meant to be a charming naivety came across to me as complete, useless idiocy. She makes bad decisions, dreams of stardom with an assuredness that becomes increasingly and ridiculously egotistical and basically drove me up the wall. I really couldn’t care less what happens to her as she seems only concerned with what happens to herself. In fact, like Cordelia, her focus on her own future makes her selfish yet she lacks the pragmatism that makes Cordelia a more likable character. The plot is very readable if not exactly unpredictable. The story certainly doesn’t have any particular depth but I suspect that this is what gives it such charm. All the girls have dealings with dashing young men with whom they go driving a lot (it’s what you did, darling) and with whom there will certainly be complications to come. It’s all very charming and there are some thrills and spills along the way – particularly as Cordelia finds herself in the family of an infamous bootlegger. 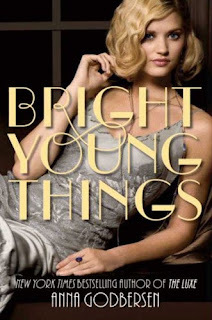 While Godberson struggled to inject much joie de vive into her Luxe series, Bright Young Things is overflowing with fun and the 1920’s is an era that has absolutely helped Godberson to find her historical chops, so to speak. I grew up absolutely in love with this era, adoring Jeeves And Wooster and Bugsy Malone – to me it has always seemed a time that was alive with potential, innocence and general fabulousness and these are the aspects that the author has captured so wonderfully in Bright Young Things. From the descriptions of New York through the eyes of Letty and Cordelia and the initial introduction of Astrid, walking barefoot in silk pyjamas through her garden to the beautiful description of the fashions of the era, the writing is pitch perfect. Bright Young Things evokes perfectly exactly what I was looking for when I picked it up: the gorgeousness of an era long gone, where men dressed fabulously and woman were just starting to believe that they could do absolutely anything. If you are looking for Historical Fiction Of Great Literary Merit then this may not be the book for you. 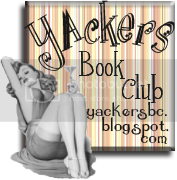 However, if you are looking for fabulous fun and rollicking romance then this is absolutely the book for you. I read it while very ill with a winter cold and it completely transported me to a different time – I was genuinely sorry to turn the last page and will certainly be picking up the next volume in the series for some more delicious escapism. Bright Young Things is available on 6th January 2011 in the UK. Thank you to Puffin for sending me this title to review. Interesting. I've read a few comments from people who said they loved the Luxe series but didn't rate this one much. I was going to pass this one, now I'm not so sure. The era definitely sways me...love that time.